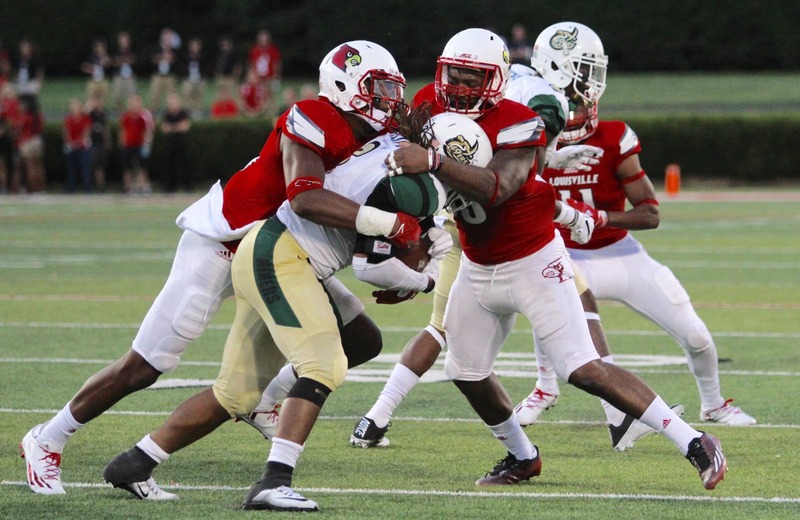 The Cardinal defense held Charlotte to less than two yards per carry. Fresh off a 56-point destruction of Charlotte, Louisville now shifts their focus on to Syracuse. Before next Saturday’s game, let’s take a look at what we saw in last night’s game. Lamar Jackson has lit up the headlines since his 800-yard performance in his final two games of 2015. What would be a better way to start his 2016 season? Did you say score eight touchdowns in a half? Because that’s what happened. Getting things started with a 36-yard sprint to the endzone, Jackson ended the first quarter with two touchdowns through the air and ground. Louisville’s 28 points in the first quarter tied a school-record. In the second quarter, Jackson mirrored his performance with three passing touchdowns and one rushing. The sophomore signal-caller found his running backs on back-to-back drives for passing touchdowns. Jackson ended the half by executing a two-minute drill in which he spotted Cole Hikutini just before time ran out. LJ8 stuffed the stat lines in Louisville’s first game. Completing 17-of-23 passes for 286 yards and six touchdowns through the air. On the ground, Jackson averaged 10.8 yards-per-carry with 119 total yards with two touchdowns. Perhaps 2015’s biggest flaw, the o-line, is expected to be much better in 2016. With four returning starters back, there is much more clarity at the position at this point. Even though the spot is more certain, that doesn’t translate to better results immediately. The 49ers pressed Jackson quite a bit in the first half. Free rushers harassed Jackson during the first 30 minutes but Jackson didn’t let it phase him. A sign of maturity from 2015 to 2016, Jackson stayed in the pocket longer and kept his eyes down field before bailing. Jackson gives his opponent credit for bringing the pressure. Over the past two years, Louisville’s defense has been the team’s strong suit. Despite putting up 70-points, the D might of stole the show once again. U of L’s defense, as expected, gave the 9ers nightmares. The Cardinals only allowed 208 total-yards and 12 first downs. Of Charlotte’s 208 total-yards, 48 were on the ground. Louisville only allowed 1.5 yards-per-carry on 31 carries and had seven tackles-for-loss. The one offensive touchdown for the 49ers did come through the air, so that’s the lone blemish on the night. Louisville brought down the quarterback four times during the game. The most impressive stat: Louisville didn’t allow one third-down conversion on 13 attempts. Last fall, Louisville got a commitment from one of the fastest rising quarterbacks in the nation. Jawon Pass committed to U of L in July during the peak of his hype. The 6-foot-5, big-armed quarterback from Georgia became the biggest QB recruit since Teddy Bridgewater. At the time, people tabbed Pass as the next big-time gun-slinger to dawn Louisville across his chest. Then all of a sudden, Jackson’s hype started building. By the end of the season, Jackson is one of the hottest names in the nation. Pass has already came out and said he’s not afraid of the competition, but it will take quite a bit to unseat Jackson this year. On top of that, to get playing time he’ll have to beat out Kyle Bolin as well. Due to the unexpected raise of Jackson, Pass might not be seeing any playing time until his third year on campus. Reggie Bonnafon celebrates his first career touchdown catch. Kenny Thomas (left, #79) and Khalil Hunter (right, #50) celebrate following Louisville’s second touchdown. Lamar Jackson rushes toward in end zone in the first quarter. James Quick had a 32-yard touchdown catch in the second quarter. Reggie Bonnafon kneels before the game.